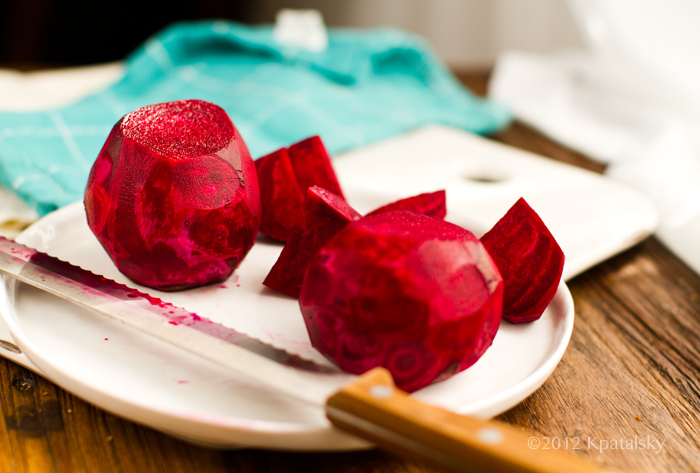 So, in honor of October, Halloween and all things spooky, today's post is a tribute to beets. Two recipes for you today + I have a quick Beets 101 to help inspire you to want to serve up this dark and moody vegetable. I get it. I wasn't always a beet lover at all. But once I learned how to use beets in a variety of ways, I learned to love them. 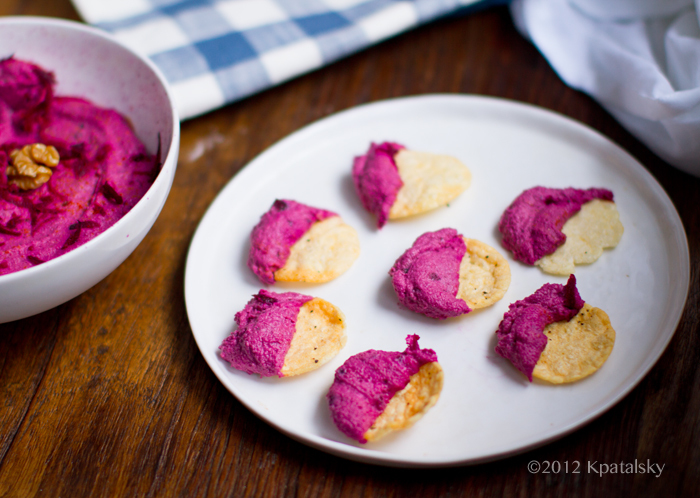 My fave beet recipes: raw shredded on salads, juiced raw, roasted beets, beet chips and now beet dip! Two Beet Recipes. First up, recipe #1 is an easy recipe for turning rock-hard, raw beets into sweet, tender, seasoned perfection: my Maple Pepper Beets. 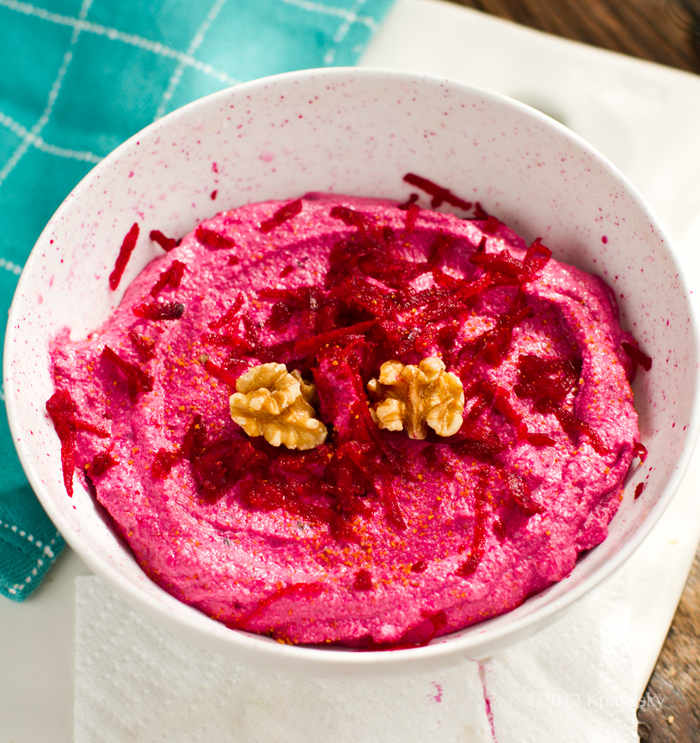 Then recipe #2 is a sweet beet dip: Beet Walnut Pate. 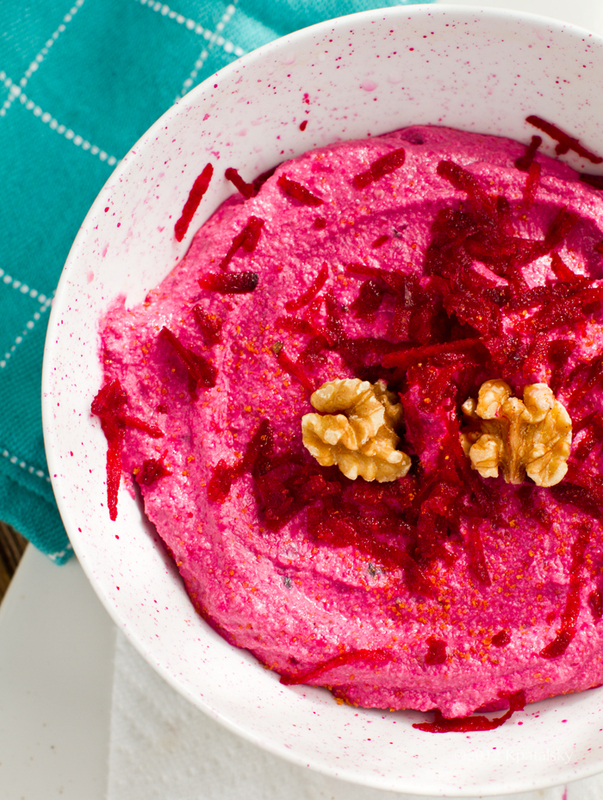 It is a savory-sweet dip that is a perky beet pink and delicious served with veggie sticks, crackers, chips or spread over top toast. Grab some beets are lets get our hands all pink and messy!.. 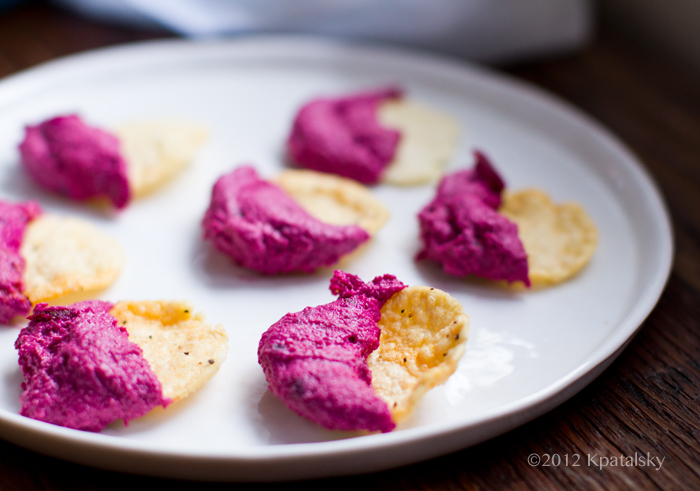 Sweet PINK Beet Dip served on black pepper Pop Chips (easy) - loved this stuff.. BEETS! Learn to love these deep red gems.. If you have never used beets in your recipes, you are not alone! Beets are quite scary looking all dark purple-skinned, rough and almost dirty-looking, with long sinister stems attached. These dark root veggies look a bit intimidating at first glance. But beets are actually quite easy and fun to work with. They produce a brilliant deep red color and their flavor is sweet and light. 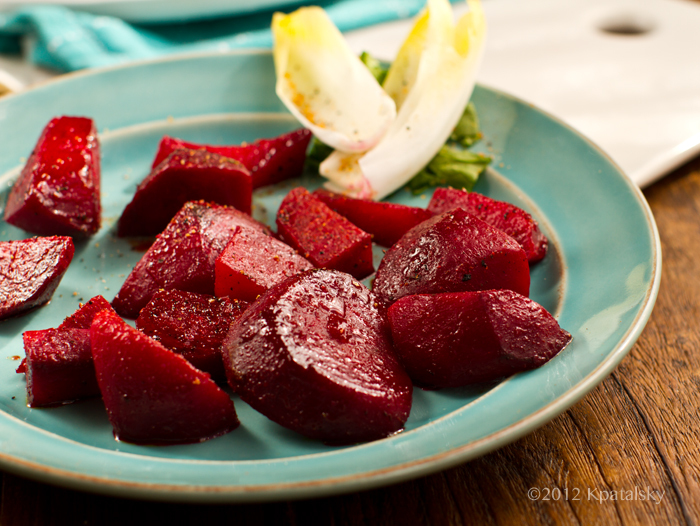 You can enjoy beets raw, roasted, boiled or steamed. You can also finish your beets by sauteing them, as I do in recipe #1 below. Beets are a very smart veggie to add to your menu simply because they are so darn healthy. That deep red color will remind you that beets are good for your heart. Beets are rich in betaine and betalain which makes them good for your heart, liver, mood and more. Beets may even help lower your blood pressure. They are also anti-inflammatory and have even been associated with lowering your risk of certain cancers. Beets are also fat free and rich in fiber, iron, magnesium, potassium and folate. sources: WHFoods Beets + Cancer. DrWeil also reminds us that, "Beets are a colorful source of anthocyanins, the purple pigments also found in blueberries, red grapes and red cabbage. They are powerful antioxidants and may help protect against cancer and heart disease." 1. Cut off the rough top and bottom of each beet, then peel off the rough exterior layer with a vegetable peeler - the same way you would with a potato. 2. Slice your beets. You can slice into large rounds, small cubes or rough medium-sized quarters. 3. In a small sauce pan or deep saute pan, add your beets and enough water to cover them. Add a few pinches of salt. Bring this mixture to a boil, cover, and boil until the beets are tender. This will usually take a good 20 minutes, depending on how large your pieces are. Smaller pieces will cook faster. 5. Saute beets on high until the edges begin to caramelize a bit. 6. Add in the maple syrup. Let it sizzle. Then turn off heat. 7. With beets still in pan, add the apple cider vinegar. 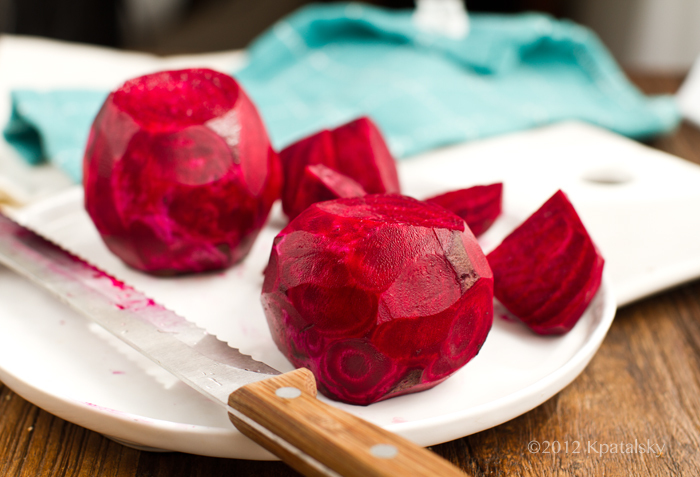 This will sizzle a lot, but also make the color of the beets POP! 8. Transfer to serving dish and serve warm or chill in the fridge until ready to use. get a sort of sweet pickled flavor which is lovely for adding to salads. 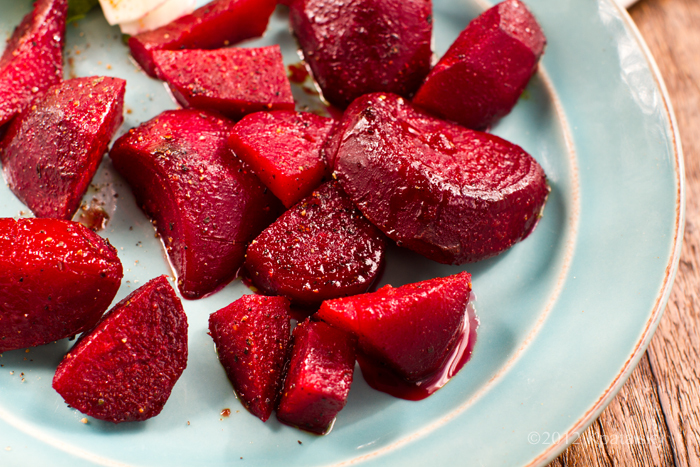 * You can also skip the boiling/saute process and simply roast your beets! Toss them in the saute ingredients and crank the oven up to 400 degrees. Roast until tender and caramelized. Delicious! vegan, makes about 2 cups - 8 1/4 cup servings - nutrition info below!! 1/2 tsp salt - or to taste! Directions: Blend all ingredients in a high speed blender or food processor until smooth. The orange juice and cranberries are optional for a sweet perky accent. I You may need to add a few splashes of liquid (either juice, non-dairy milk or water) if your blender is a bit weak. Chill in the fridge before serving. RAW option: You can make this a raw dip simply by subbing in raw agave syrup for the maple syrup and adding in either more walnuts or soaked cashews in place of the beans. This pate will chill to be a bit firmer in texture. Tasting Notes: This dip does have a unique taste. It is pink, looks different and you don't really know what to expect when you taste it! But think of it as a pink walnut dip with an accent of healthy beans to smooth out the texture. It has a sweet flavor when you add those tender dried cranberries. And sweet meets savory. I like this dip best when paired with salty crackers or toasted bread with a hint of salt. If you do not want it too sweet, leave out the dried cranberries and maple syrup - taste test - and adjust to taste as desired. I served this dip chilled, but it may even be yummy warmed or baked in the oven.. like walnut pate. rich in healthy fats + omega-3 fatty acids from the walnuts!